Google Forms Visits the Wizard! 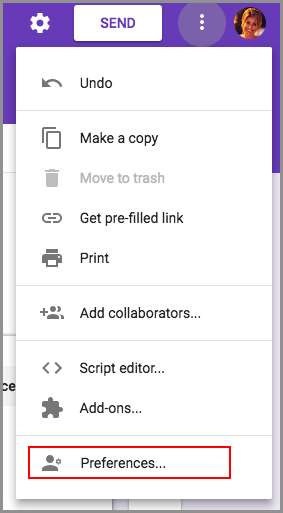 Google Forms is getting smarter! Now we can have more intelligent response validation. "When you know the specific type of answer you’re looking for, it’s often helpful to validate responses in Forms. For example, if you’re asking for a website, Forms can double-check that the answer provided is a URL. If you ask respondents for their age, for instance, we may recommend validating that the answer they provide is a whole number." There are also some new preference setting out there! 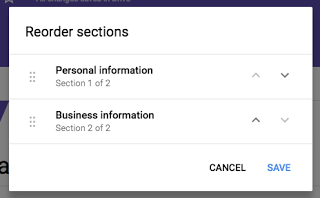 "If you use similar settings across all of your forms, you can now save time by assigning default settings to apply to any new forms you create. For instance, you can choose to always collect email addresses, make questions required every time, and assign default quiz point values." Checkbox Grid Questions!!! So excited about these. 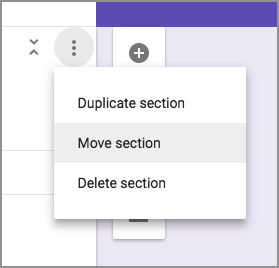 "Sometimes a question is more complex than multiple choice or checkbox answers alone can satisfy—you need to be able to select multiple options from multiple categories. 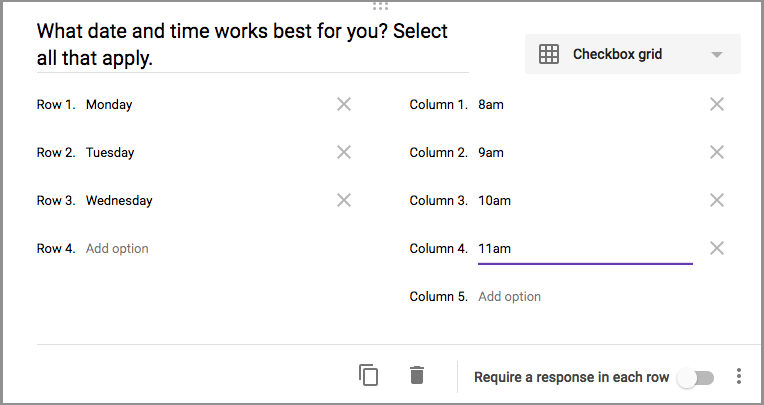 Going forward, you can use the “Checkbox grid” question type to get the answers you need, like dates and times that work for an upcoming meeting." I love this idea for scheduling writing conferences or student presentations! And....save the best for last "Section Reorder"! Moving large checkbox areas in forms has always been a pain. Now it is so much simpler! 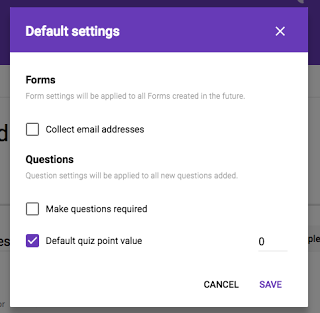 "We heard you loud and clear—you need an easy way to organize (and reorganize) your questions in Forms. In response to your feedback, we’re now making it possible to reorder whole sections quickly and easily." These roll outs should be out within the next couple of weeks! Thank you Google for listening to feedback! We love new stuff! Time! There never seems to be enough! Sorry for the lack of updates. We have been very busy moving, and I have been working on getting ready for a great session of PD that I am doing for Social Studies and Literacy Curriculum Integration! I know that it is my goal to quickly be able to navigate throughout my browser. It makes it so much easier! I find myself spending so much time clicking and moving around trying to figure out something that can be done with a quick shortcut. I'm looking at you tab jump! So working on digital citizenship has always been an issue in the younger grades. We talk about keeping your information private and being 'net savvy, but they are 10 and don't listen. How many of your elementary students already have a Facebook page? Anyway, Google introduced this new game called Interland. I am so excited to work on this with my students to strike up some honest conversation about digital citizenship and being safe online. Essentially, Google has gamified Digital Citizenship.